San Francisco Giants 4, Kansas City Royals 3. 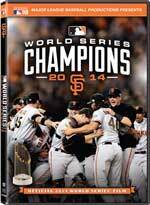 Highlights of every game of the 2014 World Series. Madison Bumgarner wins two games and hurls five shutout innings in relief in Game 7. Pablo Sandoval and Hunter Pence each collect 12 hits as the Giants win their third title in five years. Bonus features. Select DVD or Blu-Ray.